There are two events in history which have made a profound impression upon human thought, although mankind as a whole has not yet come to appreciate their full import—the crucifixion and the bodily resurrection of the great Master of Christianity, Christ Jesus. The three years’ ministry of Jesus had been leading up to the period when he was to make his great human sacrifice on behalf of mankind, and had been a preparation for the tremendous demonstration of restoring his human body, which the persecutors of his sublime teaching had declared to be dead, a demonstration which was soon afterwards followed by his ascension above all physical and bodily conditions, to the full consciousness of his spiritual unity with God. His disciples had been with him during his three years’ ministry, had listened to his teaching and watched his mighty healing works; but still they did not fully understand his message, and the spiritual import of all he had endeavored to convey to them. After the resurrection, and with the joy of finding their beloved Master alive, the Comforter, “the Spirit of truth,” came to them, and then they really understood his teaching and were able in a measure to demonstrate it. On page 135 of Science and Health she writes, “The miracle introduces no disorder, but unfolds the primal order, establishing the Science of God’s unchangeable law.” The Gospels make it clear that the betrayal, trial, and crucifixion of Jesus were experiences which he faced with patience and courage, well knowing that a mighty victory was at hand, which would be of tremendous importance, not only to himself and his disciples, but to all humanity. The cross would have been of small consequence to mankind but for the glorious resurrection which followed it; and so, the crucifixion and the resurrection cannot be separated; the two stand together. Many of those who profess Christianity are still inclined to cling to the cross, to consider it in solitary isolation, with the picture of our Saviour in his dark and brief hour of trial constantly before their thought. The cross certainly has a deep meaning for all of us; and the great sacrifice of our Master is an inspiration and example to his followers in showing the necessity of abandoning a merely material sense of life and gaining spirituality. Mrs. Eddy has written (ibid., p. 54): “That he might liberally pour his dear-bought treasures into empty or sin-filled human storehouses, was the inspiration of Jesus’ intense human sacrifice.” But in considering the example of Jesus, let us remember that as with him, so with us, the cross and the crown of victory are woven together. The followers of Christ Jesus need to take up the cross, by denying matter, material sense, and material law. Thus doing, they will demonstrate the allness of God, Spirit, perform the healing works demanded of all true Christians, and gain the crown of spirituality and victory. Should we find ourselves undergoing a period of trial, struggle, or difficulty, let us remember the strong, calm patience of the Master. A trial is but a demand upon us to give up more of material sense through the understanding of our spiritual unity and sonship with God, from whom man is never separated. Hence the crown of spiritual victory can be ever with us, right where the cross of trial may seem to be. We must watch that we do not allow our thinking to become so mesmerized by a trial and the conditions which seem to be included in it, that the problem appears to stand alone, a solitary jagged peak, constantly before our gaze. The cross in one of the illustrations of Mrs. Eddy’s poem “Christ and Christmas,” entitled “The Way,” is not alone. 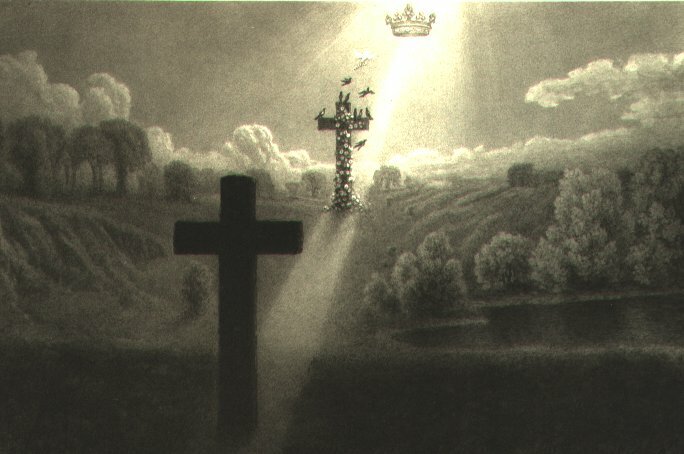 In this picture the cross stands in shadow in the foreground; in the middle distance the cross is garlanded with blossoms; beyond is the crown. Turning thought away from material sense in the midst of a seeming trial and denying its reality before the great spiritual fact of God’s allness, will reveal the presence of the Comforter. Mrs. Eddy, through her writings, has brought the Comforter to many thousands of her followers throughout the world today. She herself took up the cross unflinchingly, and gained the crown of achievement and victory. Let us have the assurance that the Comforter, divine Science, is ever at hand, and that there is always a way out of a difficulty. It took Jesus three days’ work in the tomb to find the solution to his problem. So, let us not be discouraged if it requires a little time to find the answer to the problem with which we may be coping. We can rest assured that the gaining of more spiritual understanding and a clearer realization of our unity with divine Truth and Love, will reveal the solution and show that we have the crown of victory here at hand.